Listed here are all the ingredients and products that make my life a whole lot easier. Without these staples (and there are a lot of them), I wouldn’t be able to cook the food that I love. If you don’t have some (or any) of these products in your kitchen at the moment, buy a few at time, cook with them and see if it’s something you’d like to use in your food again. These are the things that I love and you might not like some or you might have a much more impressive pantry than I do, but personalise this list to suit you, your household and your budget. 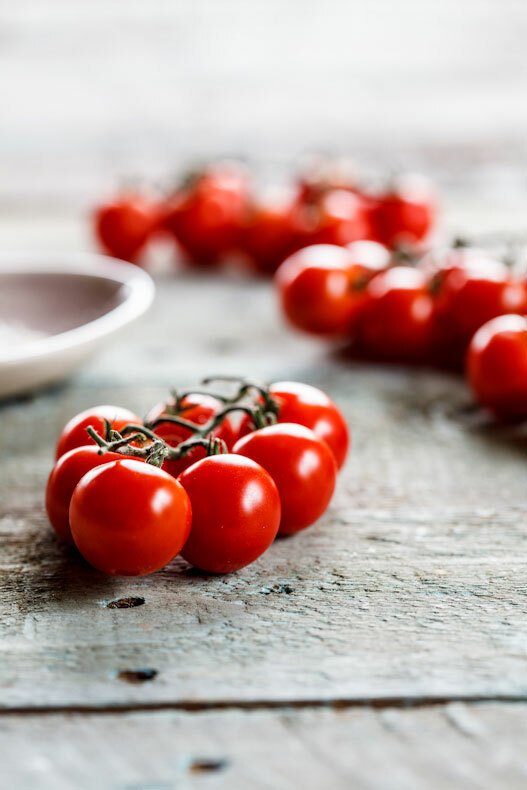 Tomatoes – Chopped, whole, puree and paste. I find the imported Italian varieties to be both the cheapest and the best quality. Beans & Lentils – Red Kidney beans, Cannelini beans (small, white beans), Butter beans, Lentils. Fish – Tuna in spring water, Crab, Smoked mussels & oysters. Pasta – Linguini, Spaghetti, Penne/Macaroni, Fussili, Whole wheat Spaghetti. Rice – Arborio/Carnaroli (for Risotto), Basmati, Jasmine, Brown & Wild rice. Other – Cous-Cous, pearl barley. Vinegar – Aged Balsamic Vinegar, White Balsamic Vinegar, White Spirit Vinegar, White Wine Vinegar, Sherry Vinegar, Infused balsamic reductions. Condiments – Dijon Mustard, wholegrain mustard, hot English mustard, Tomato sauce (ketchup), Chutney, Sweet chilli sauce, soy sauce, oyster sauce, chilli sauce (hot sauce), Good mayonnaise, Bovril, Marmite. Sweet condiments – Honey, Maple syrup, Golden syrup, Strawberry Jam, Apricot Jam, Peanut butter. Stock – When I don’t have home-made stock, I rely on NoMu’s stock concentrates. They are flavoursome and the real deal. Flavourings – Salt (I use a variety including table salt, Maldon sea salt and smoked salt), white pepper, black pepper, mustard powder, cayenne pepper. 3. Spices – I have a huge assortment of spices. I suggest that you buy whole spices and toast and grind them yourself (if you’re feeling domesticated) if you won’t be using spices too often as already ground spices lose their flavour if not used within a month. Having said that, not many people (read: almost no-one) has time to do toasting and grinding of spices so it’s completely fine if you buy already-ground spices. The ones I always have in the house are : Coriander, Cumin, Cloves, Nutmeg, Cinnamon, Mustard seeds, star anise, turmeric, paprika, smoked paprika, cardamom pods, chilli powder, chilli flakes, good quality garam masala and good quality Dukkah. I also always have a really good quality spice and herb mix on hand. Something like roasting spice or braai spice. Try to get a spice mix where you can see the actual dried spices and herbs (again, I rely heavily on NoMu’s all-for-one spice rub here). I also always have a good quality Thai curry paste and Indian curry paste in the fridge. Cereal – I always have one or two different kinds of wholegrain (read: not sugar-laden) cereals available for my kids. It makes an easy breakfast when paired with some yoghurt and fruit. Oats – Organic Rolled Oats is my favourite but I also have the instant kind in the pantry. 3. Snacks – Wholegrain crackers (Pro-vita), rice/corn cakes, nuts, crackers (salticrax, bacon kips, etc.) and popcorn are always in my pantry. Flour – Cake flour(all purpose), Bread flour (strong/00), cornflour. Sugar – White sugar (granulated), Caster sugar, Icing sugar (powdered/confectioner’s), light brown sugar, muscavado sugar (treacle sugar). Other – Baking powder, Bicarbonate of soda (baking soda), Cream of tartar, Vanilla extract, cocoa powder, caramel treat (tinned caramel), condensed milk, chocolate. Other Pantry Staples: Aluminium foil, cling wrap, baking paper, wax paper, Ziploc bags in all sizes, kitchen towel and paper serviettes. Cheese (Mature cheddar, Gouda, Feta cheese, Pecorino/Parmesan and occasionally cheese like Goat’s cheese, camembert and talleggio. Fruit, Vegetables & Herbs This really is an assortment of seasonal fruit and veg. I always have salad ingredients and the basics. Fruit – Berries, Nectarines, Plums, Melon, Pineapple. Vegetables – Lettuce, Rocket, Watercress, Cucumber, Cherry tomatoes, mushrooms, peppers, avocados, aubergines, fresh corn, asparagus, green beans, sugar snap peas, broccoli. 3. Herbs – Flat leaf (Italian) Parsley, Basil, Thyme, Sage, Mint, Chives. Meat & Fish – most often whole chickens, chicken breasts, chicken livers, bacon, sausages, stewing beef and lamb. I try to buy my fish fresh as often as possible but I do like to have frozen mussels/crab stocked and I also always have good quality fish fingers in the freezer for quick lunches for the kids. Pastry – Ready-made Puff pastry & short crust pastry. Vegetables – Frozen baby peas and corn. Bread – I often buy fresh bread in bulk and freeze immediately as we have a big household and bread doesn’t last more than a day. I also like freezing left-over bread to make into fresh breadcrumbs or if I’m feeling less-lazy, I’ll make the left-over bread into breadcrumbs first and then freeze. Stock – When I make stock I try to make quite a bit (more than 4l) and then freeze in 1l containers. If I don’t have time or I’m too lazy at the moment, I freeze the chicken bones from a roast to make into stock later on. Same goes for beef bones etc. Ice Cream – I’m not an ice-cream fan but it’s handy to have on hand when you need to whip up an easy dessert. Fruit – I’m not crazy about frozen fruit but having berries in the freezer is great. They can be used for smoothies, compotes (great over flapjacks) and in baking. Fresh Bread – I always have sliced white bread and wholegrain bread in the house. I also like to have more artisanal breads like Ciabatta, baguette, etc. in the house for easy lunches, croutons, etc. Eggs – I keep my eggs in a basket in my kitchen. I like to have them at room temperature. Vegetable drawer – Fresh garlic, ginger, onions (red and white), chillies, potatoes, butternut, sweet potatoes. Fruit Bowl – Seasonal fruit like clementines (naartjies), oranges, grape fruit, apples, pears, mangoes, bananas, kiwi, etc.